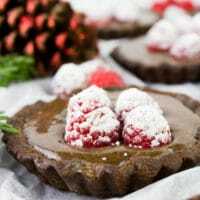 This raspberry chocolate tart recipe post is sponsored by my friends at Vitamix—Makers of the BEST blenders..ever! 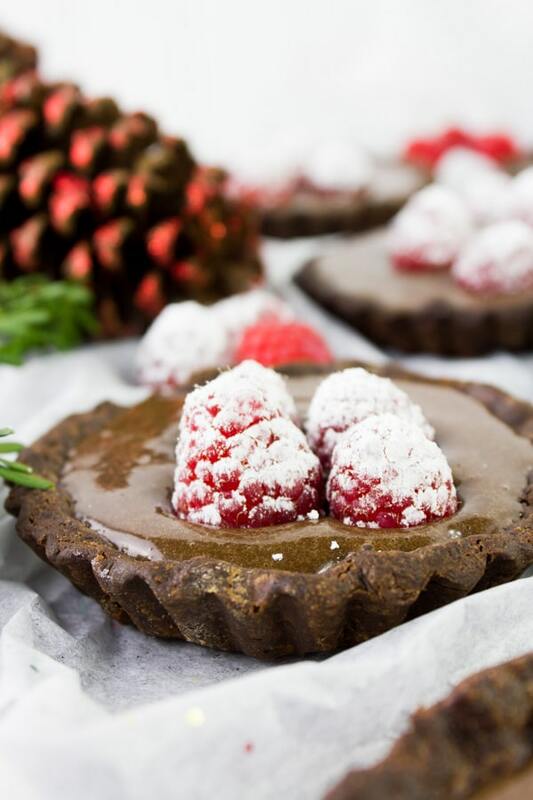 My Raspberry Chocolate tart recipe is proof that festive holiday desserts don’t need to be complicated! No-bake, easy to make ahead of time and absolutely fool-proof! What’s a holiday without chocolate? 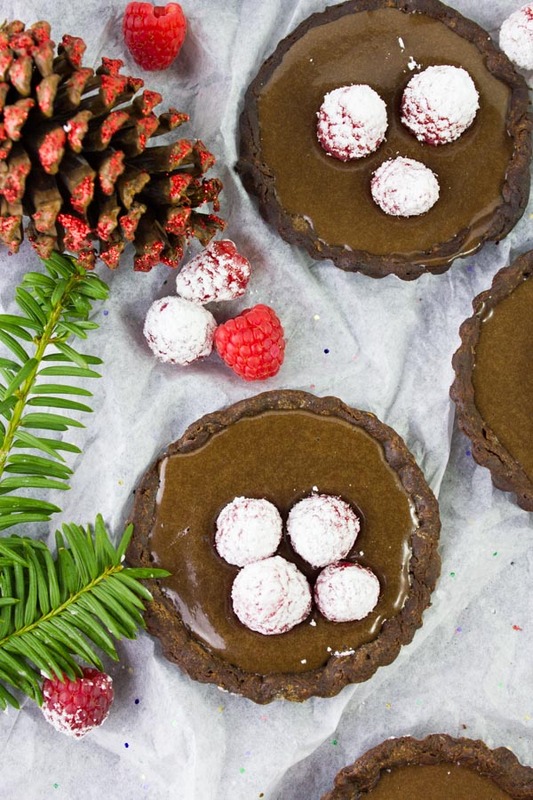 This easy No-Bake Raspberry Chocolate Tart recipe is perfect for the holiday season. Can I just say—these Mini Raspberry Chocolate Tarts are EVERYTHING! Easy. Luscious. No Bake. Divine. Perfect for the Holiday Table. You’ll thank me once you bite into a flaky delicate chocolate crust with a smooth creamy luscious chocolate truffle filling…topped with sugar-dusted raspberries! A divine combination. Plus—I’ve made you a video for it, so there’s seriously NO excuse to skip dessert when it’s this easy and luscious! I’ll make a bold confession. We never had chocolate desserts on our Holiday Table. What??? I know. I actually don’t know—I can’t find an answer. It was just like that. We had fruity desserts, cinnamon and spice desserts, puddings, creamy vanilla-based desserts…just not chocolate. And then one day, we (the chocoholics in the family) stood up and said we need chocolate at our Holiday table. We tried brownies, chocolate cakes, chocolate puddings..they just didn’t do the trick. But last year we made a Chocolate Tart, and it was all we were looking for! It’s one of those convenient desserts that you can make well in advance too—the crust can be made months in advance (unbaked and stored in the freezer), the whole chocolate tart can be made 5 days in advance and taste just as fresh and luscious. It actually tastes MUCH better as it stays in your fridge, the chocolate flavor becomes deeper and deeper. 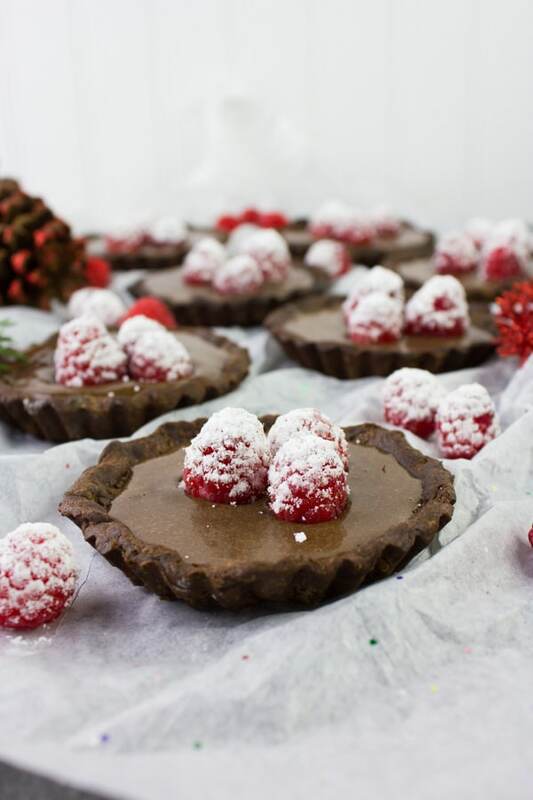 As you can see from the video, I’ve made the raspberry chocolate tart into many mini tarts. But you can definitely make this into one large chocolate tart—the only difference is the crust will bake a little longer. Again if you ask me, I’ll say make them into mini chocolate tarts like that—the crust bakes in just 12 mins, the tarts take just 30 mins to set and they feel more personal and sweet. I’ll quickly walk you through this luscious holiday dessert. Let’s start with the chocolate crust. If you’re one of those who feared making pie/tart crusts, well I’ve got you covered with my favorite TIP ever—use frozen grated butter! I teach this at my cooking classes and it’s a foolproof no-fail way to get absolutely flakey crusts every single time. You’ll just whisk the flour, sugar, salt and cocoa powder until smooth and add in the frozen grated butter. Then simply incorporate the butter into the flour mixture using a fork (no fancy equipment needed), and add in an egg and a tablespoon of water. Still using the fork, blend that together to form your crust. And it’s DONE! You’ll need to wrap and chill that crust to be able to roll it out without having the butter sticking to your rolling pin. I roll out my crust over parchment paper (again to avoid any sticking). Then cut out circles of the dough, line your tart pans, prick the dough with a fork and bake the crusts. Now comes the luscious chocolate filling. I use my favorite tool—my Vitamix to make a silky chocolate ganache. Instead of whisking the chocolate forever into the cream till it melts, my Vitamix blends the hot cream and chocolate chunks in seconds into a silky smooth ganache filling to pour over my baked chocolate crusts. At that point, it’s a chilling game. Make sure your butter is frozen thoroughly before grating. Freeze again, if you feel it’s gotten soft. If you’re making the chocolate tart the day of, then you’ll need to chill them for at least 30 seconds for the filling to set. If you’re making them in advance, then just cover the chocolate tart and keep it in the fridge for 5 days before serving. Just before serving, dust some raspberries with icing sugar—that way it really feels like a white Holiday! Place the raspberries in the middle of your tart. My Raspberry Chocolate tart recipe is proof that festive holiday desserts don't need to be complicated! No-bake, easy to make ahead of time and absolutely fool-proof! To make the crust: In a large bowl, place the flour, sugar, cocoa powder and pinch of salt. Use a whisk to whisk the dry ingredients together until well blended. Add the frozen grated butter into the flour-cocoa mixture and use a fork to blend it well—you don't want to mash the butter, you want to toss it in the flour-cocoa mixture so it’s evenly coated. Add the beaten egg to the mixture and a tablespoon of water. Use the same fork to blend the crust together. If it feels dry and not holding its shape, add a tablespoon more of water and mix it in using the fork. Gather up the dough with your hands and wrap it in plastic wrap. Chill the dough for at least 30 minutes until it hardens. Take 2 sheets of parchment paper and roll out the chocolate crust in between those 2 sheets of parchment paper (to avoid any sticking), or push the counter with flour and roll it out into an 1/8th of an inch thick. Cut out - inch rounds of the dough, and place each round on a mini tart mold, and press the dough well into the sides and corners. Or you can place the rolled out crust into a 9 inch round standard tart plate, and press the dough well into the edges and corners. Bake the tarts for 12-15 mins until cooked through, or for 25-30 mins if making a large tart. Make the filling in the meantime. Place the hot cream into your Vitamix and add in the chocolate chunks. Blend for seconds until smooth. While the machine is running, add in a pinch of salt and the vanilla. Blend for a couple more seconds. Fill the crust shells with the silky filling and chill the tart for at least 30 mins, or an hour and a half for a large tart. Remove the tarts from the fridge before serving and top them with the sugar-dusted raspberries. Make sure your butter is frozen thoroughly before grating. Freeze again, if you feel it's gotten soft. These are the most gorgeous things I have seen all week! I would love to try this recipe! 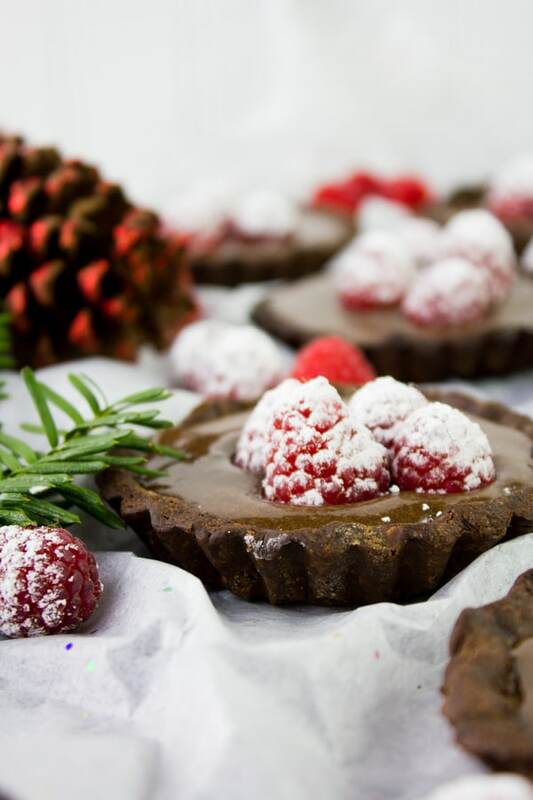 These Mini Luscious No Bake Raspberry Chocolate Tarts look pretty scrumptious! I’m really loving the “no bake” part. The chocolate raspberry part is pretty amazing as well. Great recipe, Mahy! Thank you Holly–yes the No bake makes it even easier 🙂 You will really love those tarts! So festive! I love chocolate and raspberries together! Wow! Your mini tarts are heavenly looking and I love the crust and filling recipe. Sugared raspberries on top are the tart’s crowning glory. Thank you Dan 🙂 Hope you make them soon! 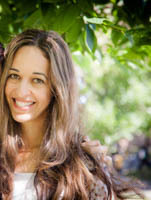 So delicious, Mahy! Raspberry/chocolate combo is my very favourite. LOVE your video, girl, you’re rocking it!! I’m going to make this with my nephews – they’ll gobble it up! This looks heavenly! Craving for this right now, so fabulous! WOW!! These are absolutely gorgeous!! It looks so good! I am drooling! OMG! These tarts are exactly what I need right now! I need to give this a try! Looks delicious!